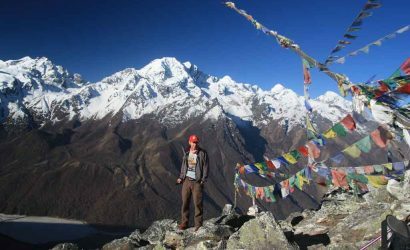 The Helambu Village trek passes through two different national parks-Langtang and Shivapuri. The trek begins at Sundarijal, only 12km far from downtown and is a popular shorter trek available closer to Kathmandu and ends further at Melamchi Bazzar. 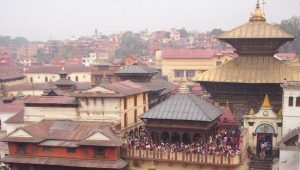 Sundarijal is the famous watershed area and the biggest resources of Kathmandu’s drinking water supply. 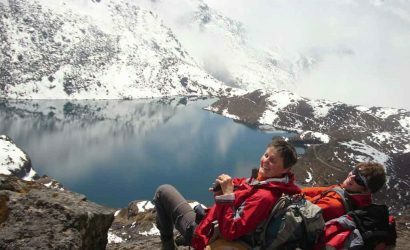 It is a classic trek having facility of home staying and suitable for trekkers who prefer less crowded trekking areas. We meet Sherpa people here but they are different from the Sherpas in Solukhumbu. The Helambu village offers a wide range of mixed cultures of Sherpa, Tamang and Lama Societies. 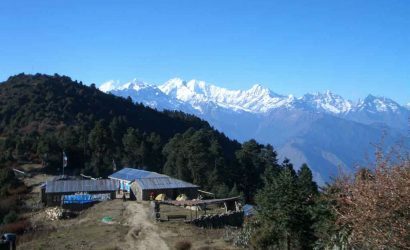 The picturesque landscape and the old monasteries are the main attractions of Helambu Village trek. Helambu village is also popular for apple production. Along the way after Melamchi Gaon, we meet another Sherpa town called Tarkeghyang, which bears its own story. 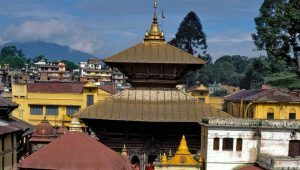 Tarkeghyang means “100 horses” & was taken from the name of a temple established in 1727 by a Lama (Buddhist monk) who was called on by the king of Kathmandu (Kantipur) to stop an epidemic. The Lama asked for 100 horses, which he brought here, as a reward. The local temple rebuilt in 1969 has a design in Bhutanese style. We drive about 12km from Kathmandu to Sundarijal. Sundarijal is situated at the elevation of 1350 meters where we start our trek. Beyond Sundarijal, the trail climbs continuously through forest to a medieval looking reservoir, the dam and waterworks. The trail leaves the water supply system and climbs steeply to a road to 1550 meters. Then cross the road and continue climb to the top of the Shivapuri ridge, the first village on the trail with the sprawling Tamang settlement of Milkshake at 1895 meters. There are few small tea shops where you can stop for a cup of tea and enjoy a spectacular panoramic view of the Kathmandu Valley. Beyond Mulkharka, the trail continues to climb steadily. After passing through the army camp, the trail enters into Shivapuri National Park. Most of the Shivapuri ridge has dense forest of pine and oak. Climb continues down the ridge through a forest of oak and rhododendron to Chisapani. Stay overnight in Chisapani or Chisopani (Cold water) at a teahouse. Trekking time 4-5 hours. Trek Chisapani to Kutumasang (2,470m/8,104ft). From Chisapani or Chisopani (Cold water), the trail continues to descend and crosses meadows and fields and soon we reach Patibhanjyang. 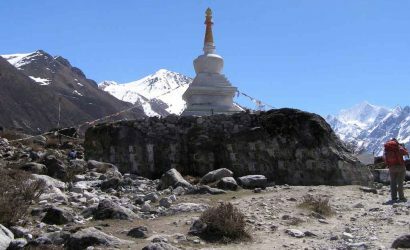 We then head north out of Patibhanjyang through a forest over the ridge and then descend to a large chorten which is the Tamang village of Gul Bhanjyang (2,130m/6,988ft). This is a delightful, classic hill village. Again we climb on the ridge from Gul Bhanjyang and finally descend again and reach our overnight stop, Kutumasang. Trekking time 4-5 hours. 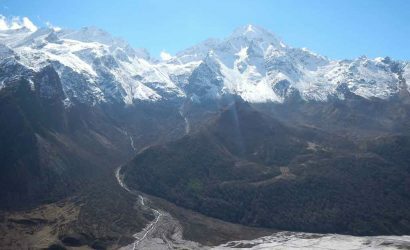 Trek Kutumasang to Tharepati (3,510m/11,516ft). Today we climb above Kutumasang on a steep, eroded trail, mostly through fir and rhododendron forests. We then descend to Magen Goth (3,220m/10,564ft). There are no settlements between Kutumsang and Magen Goth. 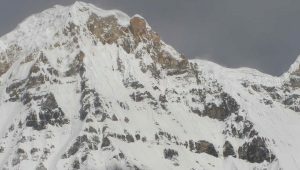 We continue further from Magen Goth and finally reach Tharepati for overnight rest. Trekking time 4-5 hours. Trek Tharepati to Melamchi Gaon (2,530m/8,300ft). From Tharepati, we descend steeply down a ravine. A trail separates for Gosainkuna Lake and Langtang Valley at Tharepati. The vegetation changes to large firs, then to oaks and rhododendron. After crossing over a stream on a suspension bridge, we make a short final climb to reach the prosperous Sherpa village of Melamchigaon, our next overnight stop. Trekking time 4-5 hours. Trek Melamchi Gaon to Tarkeghyang (2,740m/8,989ft). Our trek descends to the Melamchi Khola (River) and after crossing the suspension bridge, we start climbing up the other side of the valley towards Tarkeghyang. Tarkeghyang is the largest and picturesque village in the Helambu region. 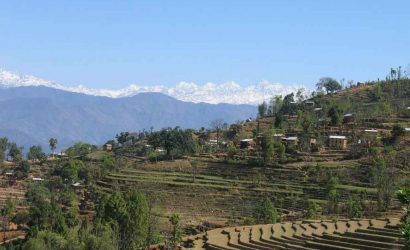 Trekkers enjoy at this beautiful village located on a shelf high above the river. 'Tarkeghyang' means "100 horses" & was taken from the name of a temple established in 1727 by a Lama (Buddhist monk) who was called on by the king of Kathmandu (Kantipur) to stop an epidemic. The Lama asked for 100 horses, which he brought here, as a reward. Trekking time 4-5 hours.